I believe in getting to know brands and their products, before sharing my experiences with you. Jumping from skincare product to skincare product doesn’t serve your skin well, as sooner or later it will rebel. Taking your time will also allow you to build an accurate picture of what this or that product can do for your skin or a skin problem you are seeking to address. 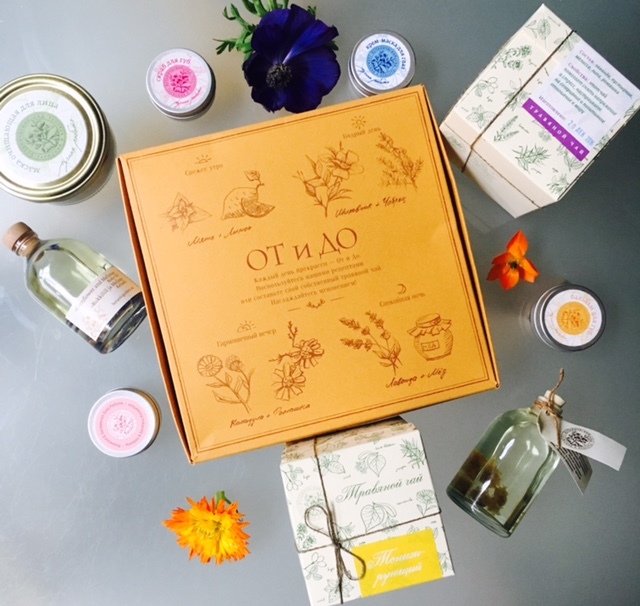 I have been using Botanic Garden products from last summer (you can read the interview with Elena & Anastasia, brand founders here) and below is my review of several BG face & body products, as well as herbal teas and a mini head & neck pillowette. Face Oil with Chrysanthemum Flowers for face, neck & decollate: this oil was given to me as a gift and I couldn’t be more delighted with the results I was seeing with continued use. The oil works well for mature skin and while I don’t fit into that category just yet, I found that it works well in the summer (when used with a light touch), when the skin tends to get dry, particularly if you are spending the time in the hot climate, as well as in the winter, when the skin can feel parched due to temperature variations inside and outside. Carrier and essential oils (Macadamia Oil, Apricot Kernel Oil, Wheat Germ Oil, Almond Oil, Clary Sage Essential Oil, Geranium Essential Oil, Grapefruit Essential Oil ) assist the process of skin regeneration, while also restoring elasticity and plumping up wrinkles, making them less noticeable. The star ingredient here is the Chrysanthemum Flowers, as substances that they contain help purify the skin and remove toxins. I like the richness of the texture of this oil, but it doesn’t prevent the oil from sinking into the skin fairly quickly, making your skin look well hydrated, plumped up and even. Elena and Anastasia recommend applying this oil to clean, wet face with light massaging movements. They also say that ‘it’s crucial to leave oil applied for 15-20 minutes’. You can use it day and night – if used in the morning it acts as a lovely make-up ‘primer’ and in the evening I tend to massage it in for a little longer, easing the tension our of my face muscles, while inhaling its subtle flower aroma. It also should be noted that since my initial use of this oil, Botanic Garden has slightly changed its packaging, or rather the bottle’s stopper, making it more ‘leak-proof’ and adapted for European consumers. It is always a positive sign when the brand takes note of customer feedback and makes changes, when necessary. Cornflour and Melissa Body Oil: My initial impression was that of simple beauty, when you take the time to put the bottle in front of you and just observe the clarity of oil and the flowers that it is infused with. Products like that are like a mini-meditation – just put it in front of you, take deep breaths and enjoy examining it like a painting you might linger at in the art gallery or museum. It really is my definition of the simplicity of beauty! This body oil was created to moisturise dry skin, including elbows, knees and soles. Thanks to the high content of unsaturated fatty acids and Vitamin E, which is like an elixir for the skin, expect your skin to look and feel more hydrated with regular use. You can use this body oil in the morning, but I tend to favour it at night-time, applying it to slightly damp skin after a bath or shower and massaging it upwards, starting with the soles of my feet and ending up at neckline. I will be honest that it’s not my favourite smelling body oil, as it has a slightly herby, medicinal smell, but it doesn’t linger on the skin for too long. It sinks in quickly and you can feel its effect almost instantly, going from ‘zero to hero’, when it comes to how your skin feels in terms of dry vs well-moisturised. Ingredients: Walnut Oil, Macadamia Oil, Almond Oil, Wheat Germ Oil, Palmarosa Essential Oil, Melissa Essential Oil, Lemon Essential Oil, Cornflower Blossoms. Face Cleansing Composition for sensitive skin: One of the founding principles of Botanic Garden is the wisdom of Ayurveda. When it comes to daily skin cleansing (essential, if you want health and beautiful looking skin, irrespective of your age or skin type) Ayurveda uses flour blends made from various ground cereals, spices and herbs. From the Ayurveda perspective it is highly important that skincare products are edible and do not contain any toxic or carcinogenic substances – because skin absorbs everything we put onto it within a few minutes of application. Curiously, cleansing composition can replace several skin care products, saving you time, without compromising on the efficacy of your daily skincare ritual. This one thoroughly cleanses skin and can also serve as a base for a face mask. For daily cleansing, take a small amount of composition (I use one tsp) and mix it with water right in your palm, then apply to the clean, wet face. If you want to have more ‘control’ & precision, mix it with a brush in a small bowl you use for skin rituals. Rinse off with warm water after five minutes and examine how you skin looks and feels. Try experimenting with the varying thickness of the resulting mixture – from paste-like, gently removing dirt, to almost dry powder-like for use as a tender facial scrub. Top Tip From Elena & Anastasia: ”If you mix composition with oil suitable for your type of skin or with lactic acid whey, you will get a great facial smoothing mask. Apply it to the clean skin for 15-20 minutes, then rinse with water. Ingredients: Ground Leaves of Ribwort and Henna, Ground Camomile Flowers, Ground Oatmeal, Ground Turmeric. Herbal Teas: I have to say that Botanic Garden herbal teas have become part of my daily routine, where I make myself a cuppa and just savour it, while looking out of the window into the garden, contemplating life or something that troubles me or a project I am working on from multiple angles. It also takes me back to my childhood and tea-time around the family table, be it with my mum or grandparents. I grew up with appreciation of plant power, so to be able to drink Russian herbal teas, which are composed in a the best way to benefit your wellbeing, is quite special. Consider what your body needs (Health? Harmony & Beauty? Energiser? Relaxation? ), read about each tea, knowledgable made from the potent Russian plants that harness the best of what nature can give us, and choose the one or ones that will help you feel better in your skin and in your body. Juices and smoothies are wonderful, but somehow a cup of tea, with its ingrained inner contemplation, harness the energetic magic that we need during our hecticly busy times. Ask Anastasia and Elena about their tea compositions and they will tell you that herbal teas are an endless source of vitamins, micro elements and other biologically active elements, which bring multiple benefits for our overall well-being. They use herbs, plants and berries, which have absorbed and harness the power of nature, buying them from Crimean ecological photo-farms, thus supporting local small businesses. The teas are wonderful to drink in the sauna & can warm you up during cold months (I carry mine in a Swell bottle that keeps it warm, which is very handy during long autumn or winter walks in the fresh air). BG teas can also improve your complexion and general sense of well-being, if you drink them on a regular basis. It is a well-known fact that good quality herbal teas also have positive effect on our metabolism. When ‘composing’ the teas, Elena and Anastasia try to balance herbs and plants in such a way that the final product will make your skin look healthier, better equipped to withstand the negative impact of environmental aggressors and thus more beautiful, as well as help you feel more balanced and positive internally. With regular use you can also expect to feel more energised & clear-headed. Your digestion and as a consequence immunity will improve, in part thanks to such simple, yet ‘heroic’ wellbeing ingredients as chamomile, calendula, mint, rosehip, melissa, juniper & motherwort. Another quaint idea that made me hold my breath in anticipation even before I opened the box, is Botanic Garden ‘From To’ tea box. It contains loose teas that will help you start the day right (mint & lemon), have enough energy to run on (rosehip & thyme), have a harmonious evening (calendula and chamomile) and a restful night (lavender and honey). The detailing, knowledge and thought that have gone into this box really shows the depth of the multitude of talents of Botanic Garden founders. It also allows you to immerse yourself into the joy of the tea preparation process. Place the tea into a special sachet with a wooden spoon, put it in a cup, pore boiling water over it and let it infuse for five minutes. You can ‘re-use’ the herbs several times and get the same benefits. At the moment you can only order the teas via Botanic Garden Russian website, but they are working on selling it soon via their European website and shipping it internationally, so do keep an eye on the website updates. The wait will be worth it! Lip Balm: this lip balm comes in a handy and somewhat old-fashioned, metal pot with a screw-on lid, which is handy for practical reasons. It promises to moisturise your lips, as well as eliminate cracks, if you develop them and this is exactly what it delivers. I tend to massage my lips with a wet bamboo toothbrush after I brush my teeth in the evening and Anastasia and Elena advocate you do the same thing. That way you remove dry skin and by applying a lip balm before you go to sleep, you help the delicate skin on your lips regenerate and become softer over time. Plus butter and oils, the components of this lip balm, will be absorbed even better and work more efficiently. Botanic Garden Top Tip: ‘Such simple massage and everyday moisturizing with the balm will help to restore original colour of the lips’. Ingredients: cocoa and shea butters, beeswax, sea buckthorn oil, rosehip extract. ‘apply balm to clean lips several times a day. If your lips have a tendency for dryness, we recommend a ‘good night’ routine: massage your lips with a tooth brush during evening cleansing, then use our rose petals scrub (note: see review of this product below), finally moisturize the lips generously with the balm. A content smile and laughing lips are guaranteed in the morning’. My own tip is to pat this cocoa smelling balm into your lips – somehow it feels gratifying, as it seems to plump up my lips naturally and brings a little bit more of your natural colour to them. Equally, it acts as a perfect moisturising ‘primer’ before lipstick application. I like how it feels ‘solid’ in its jar and there is no risk of it melting, or leaking in your make-up bag. It looks great on a work table, adding a feminine touch to a masculine environment, if you work in one and my daughter is eager to ‘borrow’ it, while I feel safe in the knowledge that she isn’t ingesting any harmful ingredients. Small things like that actually help establish a wonderful skincare routine for a young girl and build a dialogue between mothers and daughters, if you fit into that category. I am honestly horrified when I see the ‘alternatives’ that little girls apply to their lips from a young age and am gently navigating my own daughter in the direction of natural, safe and wise beauty. Lip Scrub: if I am such a good advocate of using a wet brush as the natural scrub for the lips, why do I need a lip scrub you might ask? Well, it caught my eye and I just had an urge to try it, even though I don’t generally scrub my lips with a scrub. Made from rice flower, jojoba butter, apricot kernels, beeswax and ground rose petals, this scrub is a very clever, natural multi-tasker. Apply it to your lips, gently spreading it all over and massage it for a few minutes; then leave it on the lips for a minute or two, wash it all with cool water and notice that your lips aren’t just soft and less flaky, they actually have some natural colour added to them. If I have a spare minute in the morning, but no time for proper make-up, this is my 2-in-1 product that makes my lips ready to talk to the world. Try using it on wet or dry lips and find which way works better for you – I actually decide in the moment in time. So, if before I would have scrunched my face, if asked whether one needs a lip scrub, now I would nod and whisper an experienced ‘yes’. Creamy Mask for the Eye Area: now, in the last couple of years I have tried many eye products, because yours truly goes to bed late, gets up early and it does show in the length of my under-eye shadows! I have several favourites that work for me and making my eyes look fresher. This cream eye mask intrigued me and Elena and Anastasia were kind to indulge me and sent me a pot to try. When I unscrewed the lid and lifted it off, the texture of the mask blew any of my expectations away, giving way to a clean page. Imagine a jar of freshly whipped cream that is as delicate, as baby skin – just looking at it made me open my eyes wider in wonder and delight! It promises to improve the appearance of the skin in the delicate eye area, as well as help relieve the symptoms of visual fatigue (hello computer and social media addicts!) and normalise balance of liquids arounds your eyes by reducing puffiness. It also will help to plump up small wrinkles that you might have in the eye area and I have a hunch that more younger women will notice their appearance earlier than the generation before them, who weren’t glued to their phones and computers. Technology has its drawbacks too! Dip your clean pinkie into the jar and pat the mask lightly around your orbital bone, while inhaling the light aromas of bergamot & lavender essential oils, which relax the senses and help ‘fit’ into your night-time skincare routine perfectly. When you move your finger, use the following technique: on the upper eyelid go from inside out and on the lower from out in, this way the mask, which is rich in essential oils will spread as it should due to your blinking. Using it is a pure delight and I feel like an excited teen every time I lift the lid of this cream eye mask. Intriguingly, it looks like a cream, but when you apply it, it feels like a mix of balm and oil, making it incredibly ‘glide’ on the delicate skin. If that’s not the magic of creation, I don’t know what is! Within about three weeks of use (and you need a little at a time) I noticed that my eye area looked more moisturised and the dark shadows were less noticeable, without the actual change in my sleeping routine. Smitten isn’t the word here, completely in love is more precise. Ingredients: shea butter; jojoba, avocado, apple seed, wheat germ oils; fennel, cyprus, bergamot, lavender essential oils. Ingredients: shea butter, beeswax, sandal, rosewood essential oil. To use this solid perfume, unscrew the lid, put the warm tip of your finger in, lift some product and apply to your pulse points. If you think you might be sensitive to ingredients, apply to the inner arm, at the elbow and observe the reaction. If no itchiness or irritation occur after 24 hrs, you are good to go. I apply it to temples, behind the ears and inside the wrists – any pulse point you fancy really. I also applied it to my nose, before going out, so I can inhale the subtle scent and get myself into the mood to face the day – focussed and fresh. Perfume balm is handy for travel and when you are getting on with your busy day, as there is no risk of it leaking into your bag and spoiling it. This little pot is also like your mobile aromatherapist, as you can re-apply it when and as you feel like it. Aromatic Pine Tree Pillowette: this might seem a bit unusual, but since I purchased it a few months ago, it has become my faithful companion on my travels, as well as when I read in bed, or am in shavasana on my yoga mat. Filled with herbs and cereals, Botanic Garden prides itself on using only natural ingredients – be it the actual plants, essential oils or the cloth from which those miniature pillows are made. Another little ‘secret’ is that they use tried & tested aromatherapy recipes, which help to balance your mood, wellbeing and life energy. I was initially drawn to the the Pine tree miniature pillow because I love those wonderful trees and inhaling their cleansing, energetic aroma, when I get to walk through the pine tree forrest or park. Like this pillow, it allows me to relax, without feeling floppy, as well as makes me feel positive, while reflecting on life or the day that I am laying to rest. This one was a gift to self and I adore it, as it also became part of my home interior. I take it on my travels and sometimes, when I walk around my home tidying up, I pick it up, gently squeezing and inhale the aroma that puts a serene smile on my face. A simple habit with multitude benefits! It is quaint and maybe a little old-fashioned, with the hand embroidery of the name of the tree, as well as its branches -just holding it in my hand creates a special ritual and positivity by association. I hope my review took you on an extended journey of understanding the story of Botanic Garden and what makes it so special. As life goes on and I move further from my childhood, I feel increasingly sentimental about my roots and the magical power of Russian nature, but this post is more of a story of learning from the past and experiences of two people, Botanic Garden founders, whose special knowledge of plants & Ayurveda fits so perfectly into our modern day. Their products help address not just our skin and body care needs, but no less importantly, our inner needs, as sadly more and more people feel disconnected from nature, roots and reality. Botanic Garden builds on the past and helps us feel happily grounded in our present by offering us the effective simplicity of skincare and wellbeing rituals. Pause and consider this for a moment – best things in life truly don’t have to be complicated, but a brand build on wisdom and power of nature will always be special and resonate with those of you who crave balance, inner joy and connection to nature, as well as making their own, unique imprint on the world.